On Wednesday, a 35-year-old mother of two named Guadalupe García de Rayos was arrested in Phoenix. Her original contact with police came eight years ago, when Sheriff Joe Arpaio raided the water park where she worked and charged her with using a fake Social Security number. Since then, de Rayos, who came to the United States as a teenager, checked in annually as required with Immigration and Customs Enforcement (ICE) officials. Each time they chose not to deport her—with no major crime on her record, she was not a priority. That changed with Donald Trump’s election. Though Trump’s Muslim-travel ban has gotten the lion’s share of press attention, there’s another group of immigrants he’s moved to target: people like de Ravos who have come into contact with the criminal-justice system. After her arrest on Wednesday, a group of protesters (including her two American-born teenage children) managed to block the van as it carried de Rayos out of the ICE facility. The halt was dramatic but temporary: De Rayos was deported on Thursday. By Friday, immigration agents had staged raids in at least six states, marking the beginning of a crackdown. The executive order’s nearly boundless discretion, coupled with Trump’s full-throated commitment to mass deportations, will likely result in intrusive police tactics that violate the Fourth Amendment’s limitations on searches and seizures. This comes at a moment when litigation and Black Lives Matter protests are challenging many cities to move away from invasive, aggressive policing. Now Trump’s agenda forces local authorities to make a choice: uphold the protections guaranteed in the Fourth Amendment, or be co-opted into a mass deportation project? What defines these and other jurisdictions as “sanctuary cities” is, largely, their decision to ignore ICE detainers. Detainers are requests from ICE to a local jail asking it to hold someone past the time the person would normally be released, so that ICE can investigate their immigration status. The innocuous-seeming document is critical to ICE, allowing the agency to turn jails into a nationwide lake from which to fish for deportable individuals. The overwhelming majority of the 11.5 million people admitted to local jails each year are there for traffic and other minor offenses, making ICE’s detainer strategy good for increasing deportations but bad for public trust. 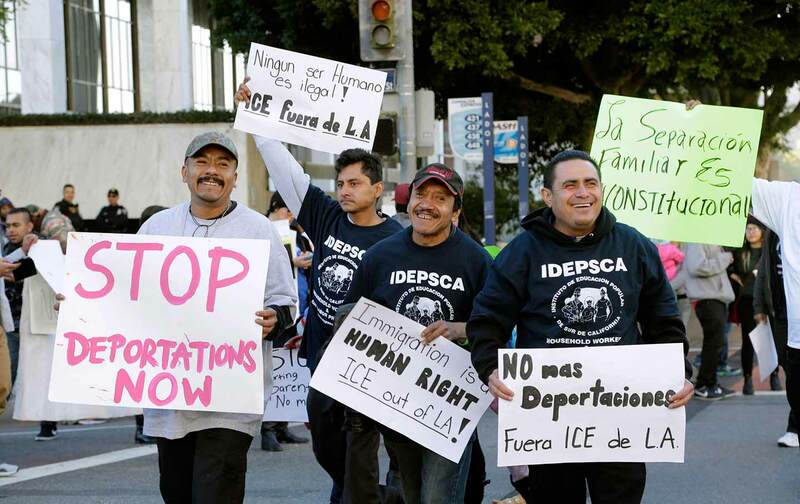 Local law-enforcement agencies that honored ICE’s detainer requests have come to be seen by immigrants as a cog in ICE’s deportation machinery. Trump has indicated he’ll be precisely the sort of authoritarian the Fourth Amendment was intended to protect against. As a candidate, Trump vowed to institute nationwide stop-and-frisk. As president-elect, he promised to deport 3 million immigrants. And within days of an inauguration speech promising to stop “this American carnage” of “the crime and the gangs and the drugs,” Trump replaced the White House website’s civil-rights page with one titled “Standing Up for our Law Enforcement Community”; nominated an attorney general committed to escalating a nearly universally rejected War on Drugs; replaced a reform-minded Border Patrol chief with one backed by the agents’ union; and ordered 5,000 new Border Patrol agents. It seems reasonable to expect a dramatic increase in unreasonable searches and seizures. The question now is whether the federal courts will uphold the Fourth Amendment as a check on the policing tactics Trump has proposed. They should, but they may not do so. Over the past decades the amendment’s broad promise of security from arbitrary police action has been made small by a US Supreme Court quick to grant deference to police departments claiming their intrusive tactics are necessary to win the War on Drugs and the “war on terror.” What remains is a doctrine described by legal scholars as arbitrary, a doctrinal mess, and an embarrassment. But with the War on Drugs fallen from favor, and nationwide protests bringing police abuses into broad view, the tide may be turning. In a shattering, widely reported dissent last term in Utah v. Strieff, Justice Sonia Sotomayor took the majority to task for its shameful refusal to acknowledge how invasively black and brown people are policed. In Sotomayor’s view, a revival of the Fourth Amendment is necessary to confront these realities. As federal courts struggle to catch up to changes on the streets, mayors and council members of sanctuary cities can establish protections that are stronger than what is required under current federal constitutional law. (And in some places, state-court judges can step in to protect people under the state constitution, where rights can be greater than what is provided through the US Constitution.) Angie Junck of the Immigrant Legal Resource Center encourages local leaders to “explicitly remove immigration enforcement from the purview of their local law-enforcement departments. This can range from not responding to detention requests to prohibiting city and county employees from asking about immigration status during any community encounters.” In Los Angeles, the City Council is working to decriminalize sidewalk vending, a trade plied largely by immigrants. Mayor de Blasio has floated the possibility of deleting a city database containing information about residents’ immigration status. As critical as these judicial and legislative actions are, the government entity best positioned to protect immigrants from Trump’s search-and-seizure operations will be the local police forces themselves. Police chiefs who are serious about protecting local residents can and should change their own policing practices—beyond ignoring detainer requests—to respect strict Fourth Amendment limitations. This can range from ending stop-and-frisk in all forms, to ending the use of pretextual traffic stops, to restricting the use of available cellphone surveillance technology, to disavowing the use of gang databases. These are not small fixes to local policing practice; they require strong local leadership willing to set new norms that place tighter restrictions on search and seizure. Ultimately, federal courts asked to place Fourth Amendment limits may look to such changes in law-enforcement practices in establishing what constitutes a reasonable search and seizure by Trump’s federal force. Trump is forcing localities to choose whether the core function of their police is to search and seize, or to serve and protect. Sanctuary cities must choose the latter, recognizing that a police force that protects and serves is one that is strongly bound by the original intent of the Fourth Amendment. Kung LiKung Li is a senior fellow at Neo Philanthropy.